Learn Cued Speech and more — an introduction to phonemes, language, speechreading, listening, and speech production. Four instructors lead you with a variety of multi-sensory activities. Parents, teachers, and children give short demonstrations of how to get started. 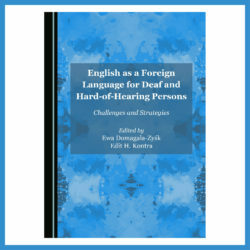 Great for teens and adults who are deaf, hard-of-hearing, or hearing. This two-DVD set comes in an album with one 78 page student workbook included. 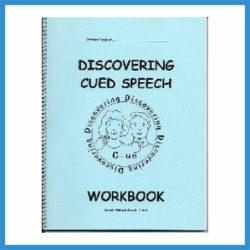 Additional workbooks and/or a teacher’s manual can be ordered separately (see our Cue Store products entitled, “Discovering Cued Speech: An Integrated Curriculum” and “Discovering Cued Speech: Workbook”). 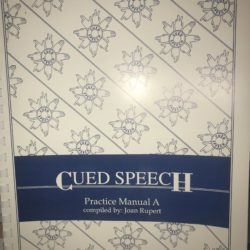 The order of teaching and practice in the “Discovering Cued Speech Instructional Video” (and all other materials in the “Discovering Cued Speech” product group) follows a method of teaching the Cued Speech system that facilitates learning to “cue read”. Students are first asked to memorize the consonant sounds associated with each handshape and the vowel sounds associated with each placement. Then, lessons which guide the student in learning and practice with each handshape and vowel placement are grouped in accordance with how the associated phonemes look on the mouth when spoken. For example, the consonant handshapes for the /p/, /b/, and /m/ phonemes (which all look alike on the mouth) and the vowel placement for the “flat-mouth” vowel phonemes /uh/, /e/, /i/, and /ee/ are all covered in lesson 1. 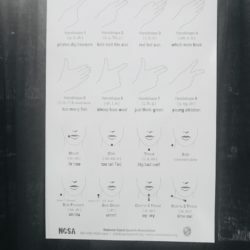 Subsequent lessons follow the same pattern, teaching the handshapes and placements in groups, according to how the mouth looks when the associated phonemes are spoken.